In many of our Microsoft Exchange migration projects we use QMMfor Exchange (Download below). 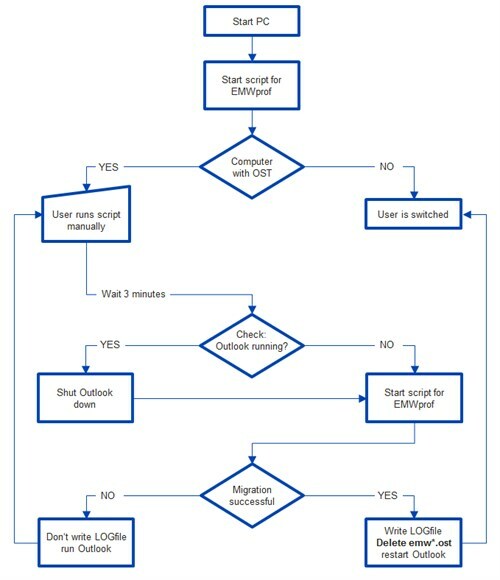 We want to show you step by step how to handle a migration project like with QMM forExchange. Before you start with the migration a proper planning and Management is necessary. First you create a concept for the new Exchange system and after that you build it. Branch offices: Number of employees who can be rolled out atonce. The performance of WAN connection should not affected. Shall the offline files (ost-file) of these employees bekept? Employees with mobile clients, such as smart phones ortablets. Do these files need to be migrated as well? If you plan your Exchange Migration with Quest Migration Manager you need to know the number of mail boxes you want to migrate. The license of QMM is based on this number. Prior the migration as such, both Exchange organizationsmust be prepared. QMM moves all exsiting E-Mail addresses into the target environment. But the target system However, the target system takesover stamping the primary e-mail address. For this reason, theaddress policies need to be created in the destination before themigration. In huge environments, not all users can be switched simultaneously. Therefore the parallel operation of the source anddestination organization is necessary. For this purpose define anadditional proxy e-mail address defined for each organization. Thatway you ensure the e-mail routing between the twoorganizations. Usually we choose @source.local and@target.local to clearly assign the addresses. These addresses must be registered as “accepted Domains”. In addition, you have create SMTP connectors to allow routing between the two organizations. When configuring the AD sync a matching between the source and destination account is established. Depending on how these users have been created, different criteria can be used here. In most cases, the Exchange migration is preceded by a ActiveDirectory migration. If you performed the AD migration withQuest Migration Manager for Active Directory, you can use the existing QMM database. In case another tool was used, the SID History, the SamAccountNameor the e-mail address can be used as matching attributes. During the creation of the matching the mailboxes are created in the target environment directly. Using the AD attribute “TargetAddress” a forwarding from the target to the source mailboxes is created (because the created mailboxes are not used yet). If a mailbox is later switched to the target organization, the forwarding will be automatically deleted and a reverse forwarding from the source to the target will be set. IMPORTANT: Before the start of the datasynchronization all mailboxes and distribution lists must becreated in the destination. Otherwise, it may happen that mailboxpermissions can not be completely transferred. Many customers who have been working with Exchange for a longtime still have public folders. Before you can get started with the mailbox migration, the synchronization of public folders must beset up. In most cases this synch is set up bi-directionally. If the synchronization of public folders is running, you cancreate the jobs (collections) based on the rollout plan. Please take care that each collection can only be bound to one target database. If the mailbox data is synched you can set the collection to”switch” mode. Is the mailbox successfully switched, the clients need to bechanged as well. Smartphones and Tablets usually have to beswitched manually. The way to do it is depending on themanufacturer. For the Outlook client Quest provides the extra tool EMWProf to automatically adjust the Outlookprofile. EMWProf searches the user’s mailbox for the hidden mail, which is created during the switch. If this email isfound, the Outlook profile on the target mailbox is changed. We usually adapt this process to the environment of our customers. Our consultants optimize it depending on the different requirements. If all mailboxes and clients are switched, the target Exchange Organistation should be cleaned up. It must not be left any permissions that were required for migration only. You can download Quest Migration Manager for Exchange here. If you need assistance with your Exchange migration, we are happy to get your message or phone call.